From Daisy Nell (chair, Gloucester Schooner Festival, Essex, MA): We've been schooner-less for 8 years, but are now back inthe game, or gam, I should say. We've just bought the brigantine schooner Redbird, at 32' on deck, designed by Bruce Bingham, and built by Norman Bonenberger, in California in 1982. We bought her from his son, Cary, who has a wonderful boatyard in Portsmouth, VA. She was built as a brigantine, but can be sailed as a stays'l schooner as well. The builder was a big fan of Black Pearl, which is interesting as I'm seeing the recent posts from Peter Warburton, whose family lived next door to us in the early 60's. I certainly remember the Black Pearl when she was in Manchester, MA, and the Warburton family as fun neighbors and school mates. 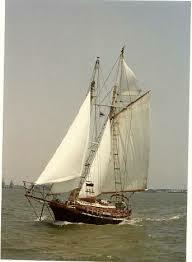 We'll have Redbird home from the Chesapeake in a few weeks, where we can begin our real salt water sailing in an attempt to catch up with the Green Dragon!